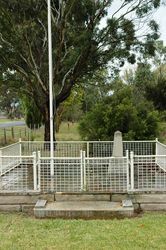 A monument commemorates the members of the 2nd / 30th Battalion who died in service or were killed in action during World War Two. OF THE 2/30 Inf. Bn. A.I.F.